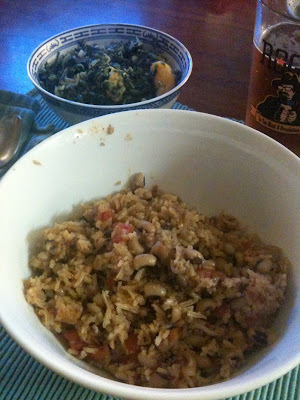 The Guerrilla Gourmet: Hoppin' John! 2) Get a saucepan hot. Dump in the rice and allow the water to evaporate, then cook for another minute until it starts to smell toasty, then add a tablespoon of olive oil and keep stirring until the rice browns. 3) Add the shallots and creole seasoning and stir for a few minutes until the shallots soften up and the creole seasoning gets good and fragrant. 4) Add the tomatoes, stock and black-eyed peas, then bring to a boil and take back to a simmer. Let it go for forty-five minutes and check to see if the beans and rice are just cooked. The greatest joy of this dish is in the slight pop of the peas and the nutty graininess of the rice. If you stir the beans too much or overcook them it becomes just mushy beans and rice and your family will suffer horrible diseases (I'm not this superstitious, but some people are.) When it's ready, cover the pot and pull it off the heat for 10 minutes, then serve with crusty bread, hot sauce (I like mexicanValentina, but there's a lot of discussion on the subject) and lots of greens on the side.